Oxford University Press, 1988, Hardback in Dust Wrapper. Condition: Very Good — in Good+ Dust Wrapper. Dust wrapper a little wrinkled at the edges with a short closed tear and a nick to the head of the upper panel. Text complete, clean and tight but a little age-tanned. From the cover: “The second part of my autobiography I hope to write before I die. So ended Towards the Mountain, the first volume, published in 1980. 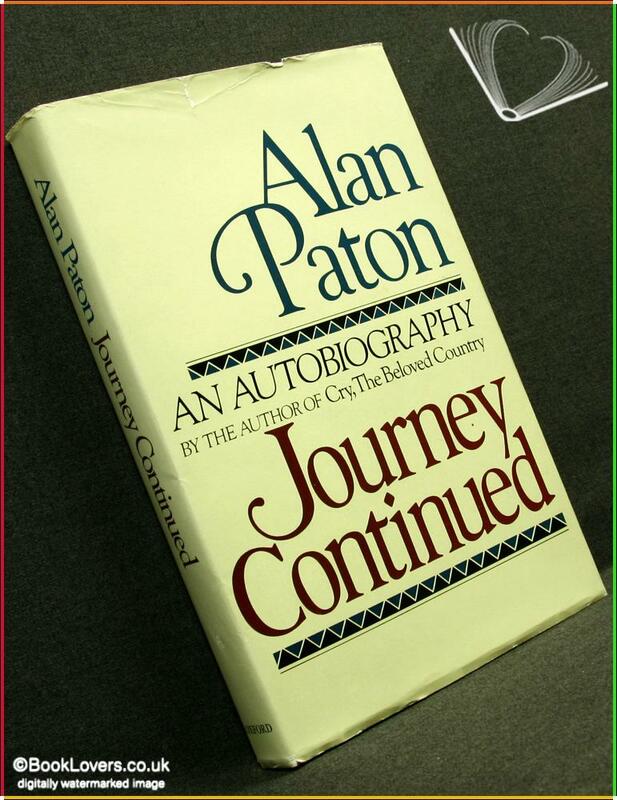 Alan Paton did indeed complete the writing, and the proof-correcting, of this second part, which he with characteristic modesty entitled Journey Continued, but he did not see the finished book. He died on 12 April 1988, while this book was being printed. Journey Continued begins in 1948, in which year occurred two of the decisive events of his life: the publication of his unprecedentedly successful novel Cry, the Beloved Country, and the coming to power of the Nationalist government in South Africa. Both events continued to exercise powerful influences on his life, even forty years later, and form part of the two main strands of this book — the literary and the political. The autobiography ends in 1968, when the Liberal Party was forced to disband itself or to betray its non-racial principles; an Epilogue brings the story up to the present day. From Cry, the Beloved Country, a musical and a film were made. Paton wryly describes the making of this film and this musical — the latter acclaimed by the audiences, but not by Paton. 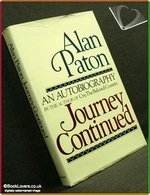 The period of the book covers all of Alan Paton’s writings, notably his other novels Too Late the Phalarope and Ah, but Your Land Is Beautiful, his great biographies of J. H. Hofmeyr and Archbishop Geoffrey Clayton, his poignant memoir on the life and death of his first wife Dorrie, and the first volume of his autobiography. How they came to be written, who helped him — and who did not — and his own sometimes surprising, often illuminating evaluations of his own work — all this richly interesting material is here, not least his account of the biography he became deeply involved in but preferred not to complete, of Roy Campbell. His political life is covered too, notably his part in the founding and nurturing of the Liberal Party of South Africa, of which he became National Chairman, working closely with Leo Marquard, the Ballingers, Donald Molteno, Peter Brown, Edgar Brookes, Jordan Ngubane and Patrick Duncan. His encounters with the African leaders Albert Lutuli, Robert Sobukwe and Z. K. Matthews, and with the controversial priests Trevor Huddleston and Ambrose Reeves, are of special interest. He gives evidence in favour of Nelson Mandela and others at the Rivonia Trial and endures a savage cross-examination. He agonises over the young members of the Liberal Party involved in the African Resistance Movement (A.R.M.) and its bombings. During his overseas travels he meets and assesses great men like Nehru, Reinhold Niebuhr, and.Martin Niemoller. Through this autobiography runs his uncompromising opposition to apartheid and its proponents, and at the same time his championship of the liberal tradition of justice, freedom and tolerance in striving towards a non-racial democracy in South Africa. Always he insists on the persistence of hope in the South African situation. Jacket designed by Paul Bacon. Size: 9½" x 6¼". Grey boards with Black titling to the Spine. 308 pages.